The stage was set, one week later 4 children in the household were rampant with the chicken pox. 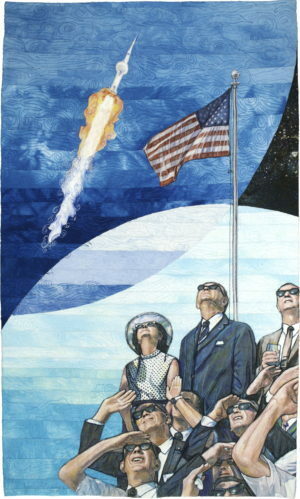 Today’s memories of NASA history, I sat down to design the one that I am most inspired by and moved to create in fiber. A pencil and paper in hand design to concept started with circular pattern movements and then to the color thought process. The main pictorial focus image chosen is the July 16, 1969, Apollo 11 liftoff with President Lyndon B. Johnson and Mrs. Johnson amongst the crowd viewing the launch tied to the actual space rocket liftoff with America’s glorious flag waving its glory. My personal favorite fun play of the art quilt was to dye the fabrics, create the dimension in color for the sky transitions, paint space with background particles that all materialize together in the spontaneous random quilted movements. Intrinsically a visual feast that meets history, story telling, artistic fun play and art quilt. Artistically rendered hand colored images, hand dyed and painted surface design fabrics. Machine appliquéd, pieced, quilted, Trapunto techniques. Procion dyed ultra sheen cotton fabrics and threads, Prisma colored oil pencils, inks and acrylic paints.